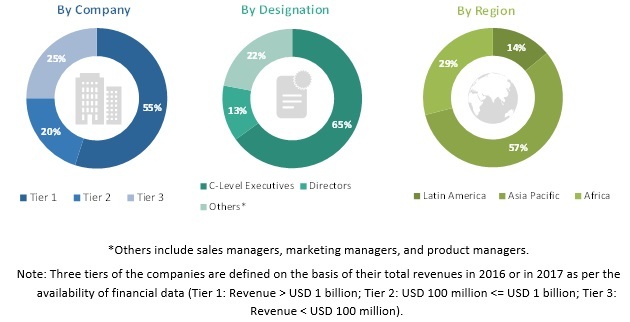 [101 Pages Report] The biofortification market is estimated at USD 78 million in 2018 and is projected to grow at a CAGR of 8.6% from 2018 to reach USD 118 million by 2023. The study involves four major activities to estimate the current market size for biofortification. Exhaustive secondary research was done to collect information on the market, peer market, and parent market. These findings, assumptions, and market size were validated with industry experts across the value chain through primary research. Both top-down and bottom-up approaches were employed to estimate the complete market size. Thereafter, the market breakdown and data triangulation were used to estimate the market size of segments and subsegments. In the secondary research process, various secondary sources such as Hoovers, Bloomberg BusinessWeek, and Dun & Bradstreet were referred to, in order to identify and collect information for this study. These secondary sources included annual reports, press releases & investor presentations of companies, white papers, certified publications, articles by recognized authors, gold & silver standard websites, food safety organizations, regulatory bodies, trade directories, and databases. The Biofortification Market size, in terms of value, were determined through primary and secondary research processes. After arriving at the overall market size using the market size estimation processes as explained above the market was split into several segments and subsegments. In order to complete the overall market engineering process and arrive at the exact statistics of each market segment and subsegment, the data triangulation and market breakdown procedures were employed. The data was triangulated by studying various factors and trends from both the demand and supply sides, in the food & beverage industry. This research report categorizes the biofortification market based on crop, target nutrient, and region. 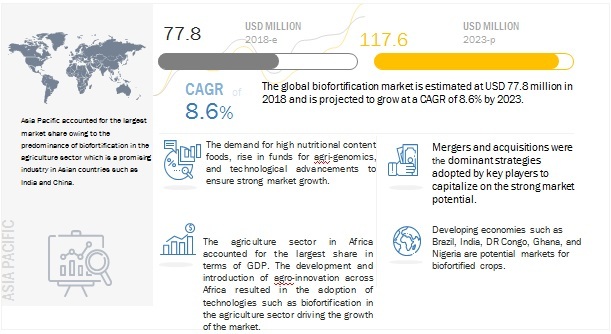 The biofortification market is estimated at USD 78 million in 2018 and is projected to grow at a CAGR of 8.6% from 2018 to reach USD 118 million by 2023. The growth of the biofortification market is driven by the rise in funds for agronomic practices and technological advancements. Biofortification is used in crops such as sweet potato, cassava, rice, corn, wheat, beans, pearl millet, and others such as tomato, banana, sorghum, and barley. The sweet potato segment is projected to be the largest revenue contributor in the biofortification market during the forecast period. The sweet potato segment is estimated to hold the largest share of the biofortification market in 2018. The demand for biofortified crops such as sweet potato and cassava has increased with the rising technological advancements to increase the nutrient content, particularly in orange-fleshed sweet potato (OFSP). Sweet potato has been an important source of energy in the human diet for centuries owing to its high carbohydrate content. However, its vitamin A content from carotene only became recognized over the past century. Using biofortification, sweet potato breeding in Africa is focused on higher yields, sweeter taste, and higher dry matter, which increase its carotene concentration. The vitamins segment is projected to be the fastest-growing market during the forecast period. On the basis of target nutrient, the biofortification market is segmented into iron, zinc, vitamins, and others. The vitamins segment is the fastest-growing target nutrient in the biofortification market from 2018 to 2023. The demand for biofortified crops is increasing due to the increasing demand for high nutrient content in food. The rising demand for vitamins as feed additives or in premixes from the animal nutrition industry and the increasing demand for high-quality meat products have also been essential factors responsible for the increase in the demand for vitamins across the world. 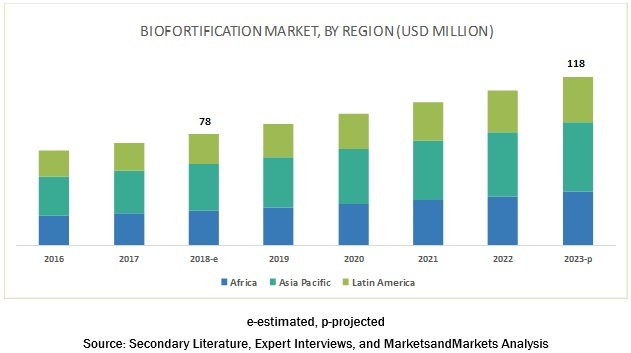 The biofortification market, on the basis of region, is segmented into Latin America, Asia Pacific, and Africa. The Asia Pacific is projected to dominate the biofortification market throughout the forecast period. This is because biofortification has strong growth potential in agriculture and also improves the nutrition content in food. The biofortification market has grown considerably over the last five years, and this trend is expected to continue in the near future. The growing consumer demand for high nutritional content in food is projected to fuel the demand for biofortified crops, globally. Key players identified in this market include Syngenta (Switzerland), Bayer (Germany), BASF (US), and DowDuPont (US). They are focusing on increasing their presence through acquisitions and expansions and developing products specific to consumer preferences. These companies have a strong presence in the Asia Pacific and Africa. They have also set up research laboratories in various regions and have strong distribution networks. In November 2018, Intertek developed its local capabilities and services at its laboratory in Beira, Mozambique. This would help the company to expand its business in Mozambique as well as in the East African region. In September 2018, Bayer acquired Monsanto (US), for USD 128 per share. This would help combine the companies¡¯ leading innovation capabilities and R&D technology platforms in the agricultural industry. In October 2016, DuPont Pioneer and Africa Harvest Biotech Foundation International, a research firm from Johannesburg, South Africa, entered into a collaboration to conduct research on the increasing vitamin E and beta-carotene production in sorghum to improve the availability and longevity of beta-carotene. In November 2015, Bayer opened three R&D institutes in Paul¨ªnia, Brazil; this center would host a resistance-monitoring laboratory and a center for agriculture in tropical regions. What are the new target nutrients areas, which the biofortification companies are exploring? What kind of competitors and stakeholders such as biofortification companies, would be interested in this market? What will be their go-to strategy for this market and which emerging market will be of significant interest? How are the current R&D activities and M&As in the biofortification industry projected to create a disruptive environment in the coming years for the agricultural sector? What will be the level of impact on the revenues of stakeholders through the benefits of nanotechnology to different stakeholders from rising farmer revenue to environmental regulatory compliance to sustainable profits for the suppliers?